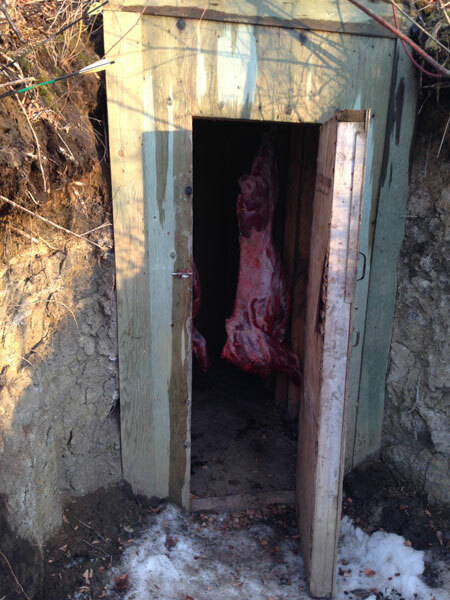 For your convenience, we have provided small cabins for your use when you hunt with us. They will accommodate a total of 8 people. There is a new 14×14 with 2 double beds and a loft with two single mattresses, wood stove, electricity and a covered deck. The other is a 10 x 20 with a small deck, wood stove, generator, lights, receptacles and a T.V. 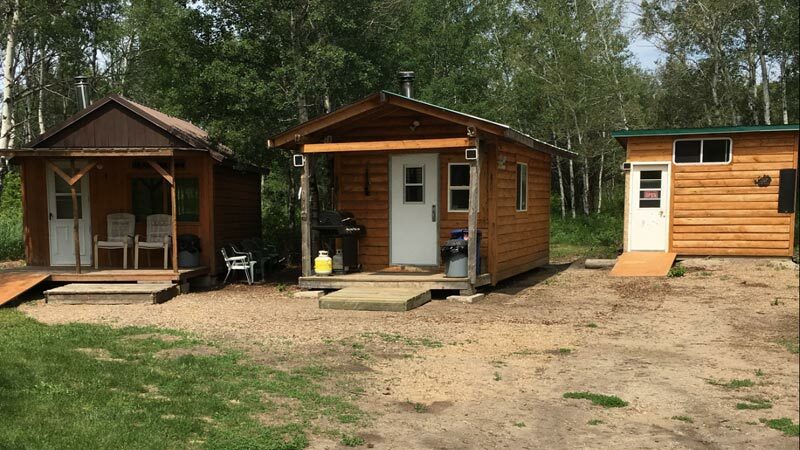 These cabins are free of charge and we do provide BBQ’s, propane, generator, garbage bags, toilet paper and antibacterial wipes. We do ask all of our hunters to respect the cabins and facilities by cleaning up after yourselves and leaving the cabins in as good or better shape then you found them. Pack as if you’re going camping, cooking equipment, sleeping bag, pillows, food, personal gear, hunting gear, water (drinking and wash water). etc. For your convenience, we have added a shower house to the camp. This facility will be available during the warm weather, (basically May- Oct), weather permitting. In the shower house there is a flush toilet, hot shower and a small hand sink. This is all operated off a 12 volt system, water tank, and tankless hot water heater. Water is stored in a small tank outside the building so once the cold weather hits, we winterize it and close it down. There is an area next to the cabins for an outdoor fire, you’re welcome to use if you wish. When you harvest your boar, there is a meat pole that can accommodate dressing two boars at once. 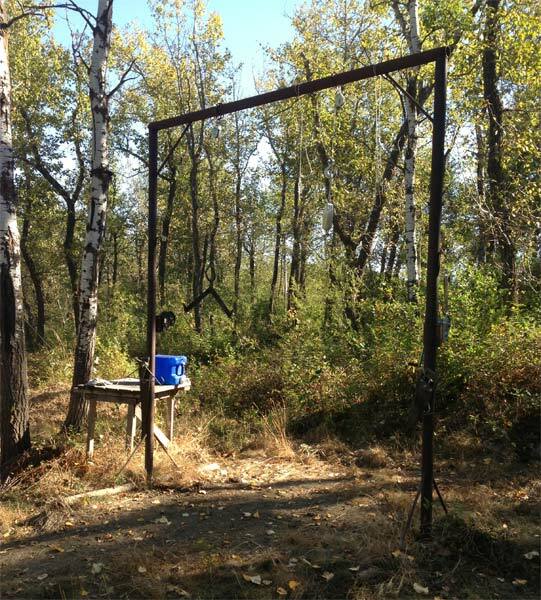 Hand winches are mounted on either side of the game pole, as well as game spreaders (gambrels). 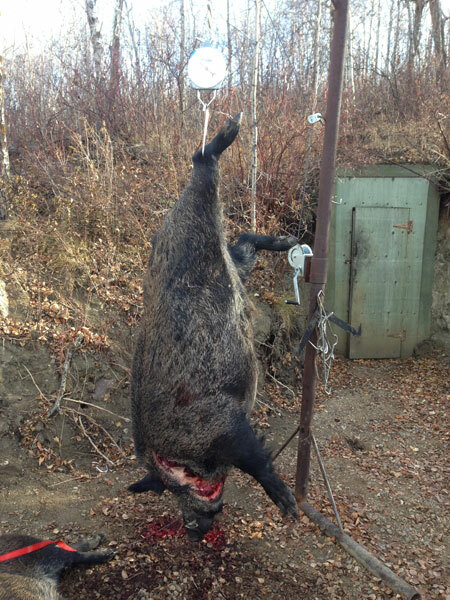 A 550lb scale is provided so that each boar can be weighed. 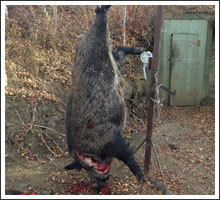 Boars are generally hung upside down and skinned, then they can be gutted and kept very clean. 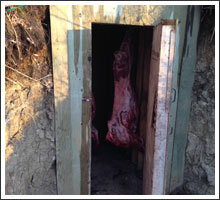 A small 4’W x 8’H x8’D cool house is built into the side of the hill near the meat pole so that if it is hot out your boar can be stored for up to 3 days where you will find it a nice cool 7 degrees when it’s time to go home. 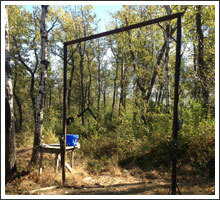 For those days when it’s cold or rainy we have a 4’x6’ shooting house placed near a wallow on 8’high stilts. There are three windows that can be opened so you can stay dry while you sit through some rough weather waiting for your boar.